Thank you for joining us at the Adopt a Drifter Program website! 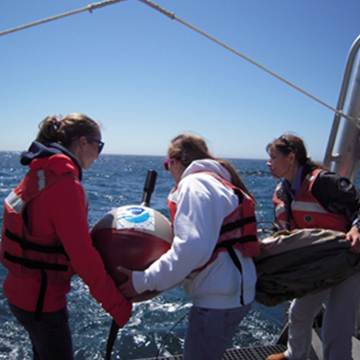 We are excited that you are interested in accessing information about drifting buoys; otherwise know as drifters, which move with the ocean currents around the globe. As drifters float in the ocean water, they collect and transmit data about the ocean’s surface. The drifter data are sent to a satellite and then to a land station where it can be accessed. Drifters are continually being deployed from ships around the world. They last for about 400 days, unless their batteries fail or they collide with something like an island in the middle of the ocean. Each drifter receives a WMO ID # (World Meteorological Organization Identification Number) so its data can be recorded. In 2005, we reached our goal of placing 1250 working drifters on the ocean’s surface, but as the drifters go off-line they need to be replaced, so we are always deploying new drifters!